One of the really fun activities I've gotten into since I moved to St Augustine is volunteering at the Colonial Spanish Quarter. I met Jenny, the tavern keeper, early on and spent a day polishing candle chimneys and lamp glass. Then I got sidetracked into working in the leather shop with Marko. The Spanish Quarter was peopled with over a dozen folk in colonial garb deeply invested in the history of Spanish St Augustine and passing their knowledge of leatherworking, sewing, cooking, blacksmithing, carpentry, black power guns and life in the 1700s to visitors. To the distress of many, including me, the city decided to close the Quarter to the general public last fall except on Market days (Second Saturday of each month.) The tavern, however, remained open, and I was fortunate that Jenny welcomed me back to work there. It's a fantastic place to hang out, lit only by candlelight at night. 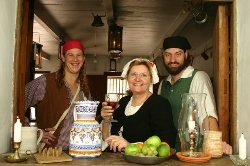 Jenny, Josh and Bill, who are the official tavern keepers are fountains of knowledge about the tavern, Spanish St Augustine, and St Augustine in general. They are all great fun to work with and make even mundane chores like bussing tables and washing glasses enjoyable tasks. We meet folk from all over the country and even other countries who come in for a glass of the best Sangria in town, or for a mug of a local microbrew. Like all the volunteer activities I've done in my life, spending time at Taberna del Gallo turns out to give back far more than I give and I enjoy every minute. For a woman who loves history, it's fantastic that I get to step back in time and live the history I so enjoy reading about. Next best thing to time travel!! It's valentines, day - when the florists sell lots of roses, chocolate is the ambrosia of the day and sweethearts everywhere celebrate their love. I started out feeling sorry for myself because I don't have a sweetheart to go out to dinner with, or cuddle with afterward. But then I stopped at the library and on my way back to the car I noticed a heart mowed into the lawn. A romantic groundskeeper - how cute. Then I got a card from an old friend. And email from new friends. My hairdresser greeted me with a wonderful smile when I arrived late and breathless for my appointment, and my dog greeted me with a madly wagging tail when I returned home. As I carried my lunch to my study to see what else awaited me in the way of friendly greetings, a tiny bright red picture frame with a heart shaped opening and the sweet little face of one of my granddaughters when she was two years old caught my eye. Suddenly it occurred to me just how rich in hearts I am. I have four grown children who couldn't be more wonderful no matter how hard they tried, and a step-son who's as much a part of my heart as the children I bore. 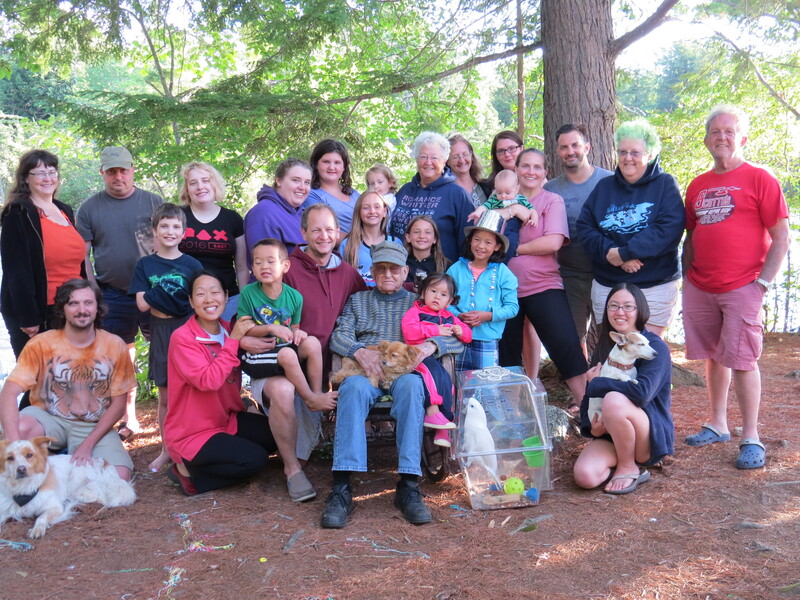 They've blessed me with twelve grandchildren, each special and loving in their own way. My Dad is still with me, and he writes to me regularly. My sister and brother are distant in miles, but close in affection. And I've friends all over the world. Some close by, some on the far away, some new, some old, and all gifts bringing immeasurable blessings into my life. Life truly is good to me. Thank every one of you for being part of it. Okay - time to get back to work and get this manuscript into shape. At a conference last fall, I won a critique from an editor of a well-known publishing house. It included a 15 minute phone call to discuss my project. While I would have loved to have her ask for the full manuscript (who wouldn't?) I got the next best thing. In her words, "The writing is strong, the characters come to life and I found the world engaging." She went on to discuss genres and the fact that while this story had a lot to recommend it, I needed to focus on a specific genre and aim my writing toward it. She had a lot of tips on where I could go with this effort, and she also wanted me to consider how it might be made into one of a three book series. She ended by saying that if I wanted to resubmit this book when I had worked on the issues we discussed, she would be glad to look at it again. Words of supreme encouragement. Now to get to work. On the book I was working on when she called, on the book we discussed, and on ideas for two more. That ought to keep me busy and out of trouble! A Terrific book I just couldn't put down! There are books and reading material everywhere at my house. My library has floor to ceiling bookshelves stocked with hundreds of great books of all descriptions. I have a Kindle with 300 or so books on it and there are several more on my iPhone. I read every chance I get. Most of what I read is enjoyable or enlightening, but once in awhile a book comes along that touches me in a way most never come close to. On the Island, by Tracey Garvis-Graves, is one of those books. Her hero and heroine are so compellingly real and when they are faced with hardship and difficult decisions their courage and concern for each other grabs your heart. They not only grow as characters in a story, but they grew on me, the reader, until I couldn't help but cry with them, celebrate with them and feel a deep down connection. I started reading the book on my iPhone while I was waiting for an appointment. I picked it up again in between things, but last night, I took it to bed with me and couldn't put it down. I have not been so touched by a hero in a book in years. T.J. Callahan is an endearing young man who grows both in stature and character, mature beyond his years in so many ways, yet engagingly innocent and young. It was a pleasure to spend time with him and Anna. If you are looking for a great read, I urge you to find this book, available in ebook as well as paperback. "When thirty-year-old English teacher Anna Emerson is offered a job tutoring T.J. Callahan at his family's summer rental in the Maldives, she accepts without hesitation; a working vacation on a tropical island trumps the library any day. T.J. Callahan has no desire to leave town, not that anyone asked him. He's almost seventeen and if having cancer wasn't bad enough, now he has to spend his first summer in remission with his family - and a stack of overdue assignments - instead of his friends. .
Anna and T.J. are en route to join T.J.'s family in the Maldives when the pilot of their seaplane suffers a fatal heart attack and crash-lands in the Indian Ocean. Adrift in shark-infested waters, their life jackets keep them afloat until they make it to the shore of an uninhabited island. Now Anna and T.J. just want to survive and they must work together to obtain water, food, fire, and shelter. Their basic needs might be met but as the days turn to weeks, and then months, the castaways encounter plenty of other obstacles, including violent tropical storms, the many dangers lurking in the sea, and the possibility that T.J.'s cancer could return. As T.J. celebrates yet another birthday on the island, Anna begins to wonder if the biggest challenge of all might be living with a boy who is gradually becoming a man."